Dronacharya Award to Baba Ram Rahim? What's the Truth?? Here's everything you need to know about Gurmeet Ram Rahim Singh's contribution as a Sports coach & why he was recommended for Dronacharya Award. Few days back The Yoga Federation of India (YFI) recommended the name of Dera Sacha Sauda's chief Saint Dr. Gurmeet Ram Rahim Singh for the Dronacharya Award. The Dronacharya Award, officially known as Dronacharya Award for Outstanding Coaches in Sports and Games, is sports coaching honour of the Republic of India. As per reports, YFI president Ashok Kumar Agarwal said that Guru Ram Rahim has created many Yoga heroes for the nation who has won gold at World and Asian levels several times, he also added that not only in Yoga but Gurmeet Ram Rahim's contribution can't be neglected in other sports like javelin throw, throw ball, hand ball and roller hockey. This public statement from YFI was hard to digest for some of the so called "Sports Experts", some news blogs like scroll.in and Amar Ujala even stated that "Gurmeet Ram Rahim has no connection with sports" and "Ram Rahim himself is demanding for dronacharya award", but is that true? We researched as much as we can and found out that both these statements of the main stream media are totally untrue, here we will discuss what we found out about Saint Ram Rahim as coach and achievements of his students at different levels. Five Girls have won Bhim Award for their Brilliant International Performances: Parveen Kaur Insan (2017 - Roller Skating Hockey), Harpreet Kaur Insan (2017 - Roller Skating Hockey), Gurmail Kaur Insan (2017 - Roller HandBall), Yashdeep Kaur Insan (2013 - Roller Skating Hockey) and Milanpreet Kaur Insan (2014 - Roller Skating Hockey. Girls have won over 40 International Medals in Inline Hockey, Judo and volleyball too. Boys have won over 100 International Medals in Judo, Football, Swimming, Cricket, Kabbadi, Yoga and what not. All these achievements under the name of Saint Ram Rahim as a coach, it's wonderful to know that in guidance of Ram Rahim Dera Sacha Sauda has facilitated state-of-the-art International Stadiums In Sirsa for proper training of these students without any aid from government. 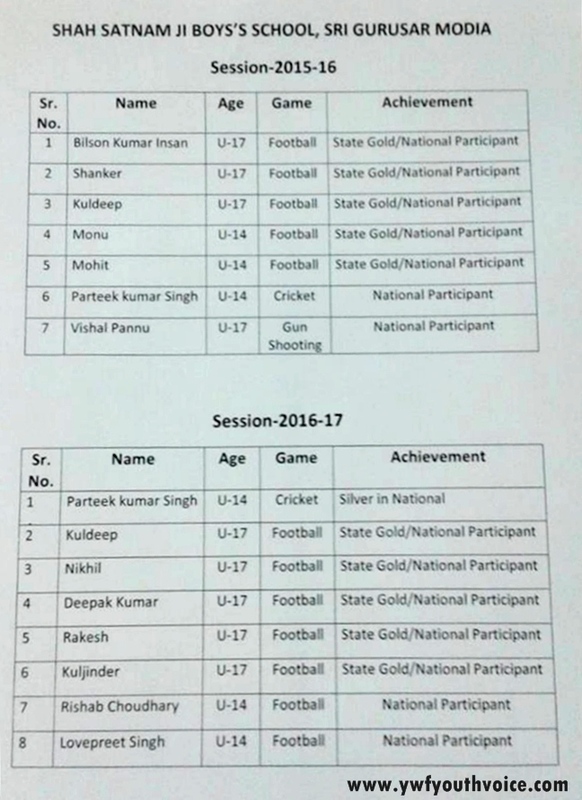 Singh awards these students with pure diamond, gold and silver medals every year for their brilliant performances for the nation. Along with respective sport coaching, Singh also helps these Athletes to boost their self confidence through meditation. Khel Gaon is ready in Dera Sacha Sauda to build champions for next Olympics, Government is also supporting Khel Gaon. All this information was not much hard to found still main stream media like Amar Ujala and Scroll stated "Ram Rahim has almost no connection to support", really? you guys serious? Let me ask them was it lack of knowledge? lack of awareness? Ignorance? blind haters? or were paid to write that crap? The second statement was "Ram Rahim demanding Dronacharya Award" or "Gurmeet Ram Rahim eyes on Dronacharya Award", when did you hear any word regarding Dronacharya Award from Singh? When did he demanded for it? How low can you stoop to push your anti-national agenda? Making up stories in field of sports too like you do for bollywood gossips? Yesterday when Singh came to know about these false statements that media was making, he kind of slapped these press-titutes through his FB live where he was seen with some of his trained students, in FB live part first the girl students talked about how Saint Ram Rahim trained them from the very basics of each sport to the international level, most of these girls from villages where there was no scope for them to play, they told how Saint Dr. Ram Rahim as a coach is and how how much valuable his role was in their success. Saint Ram Rahim also cleared that he has not asked for any award in fact his awards are his students who got medals for the nation, he says "Media" is the 4th pillar of the society and should not publish baseless statements. Saint Dr. MSG does FB live every evening to interact with his fans and to promote his latest MSG movie #JattuEngineer but yesterday it was little different as the female athletes who took coaching from the rockstar Saint were present. Tonight Male athletes may be present, you can watch the live feed on his official FB page around 9PM. Let us know your views in the comment section below! Youth Voice: Dronacharya Award to Baba Ram Rahim? What's the Truth? ?